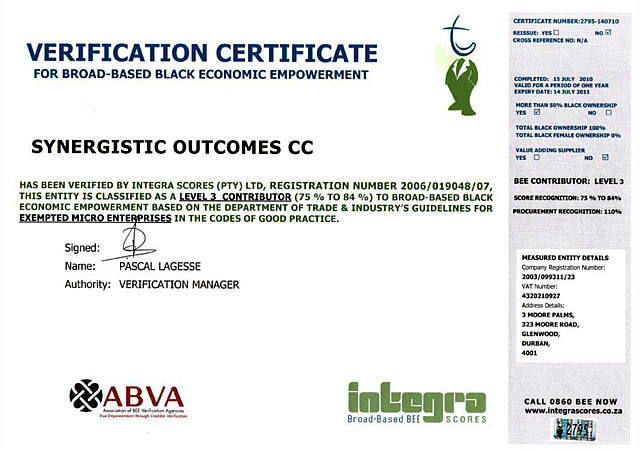 Synergistic Outcomes is a Durban based organisation which conducts and serves clients in South Africa, and in African markets. Since 2004, our BEE, SME company has helped more than 250 corporates (small, medium and large sized enterprises, government and non profit organisations) improve organisational effectiveness, in the areas of training, development, profiling, assessments and coaching. Leading collaboration, creativity and customised solutions to strategy and organisational performance. Delivering customised solutions in strategy, training, development, profiling, assessments and coaching. We strive to be true and consistent in all that we do. We recognise that being trustworthy is the basis for trust. We listen to the needs of our clients, and believe in creating win/ win solutions. Their inputs are key to successful processes and synergistic outcomes. We are prompt in responding to all queries and needs from our clients. We recognise that the customer service matters most. We strive to be flexible to the needs of our customers. We are willing to adapt and always go the extra mile. 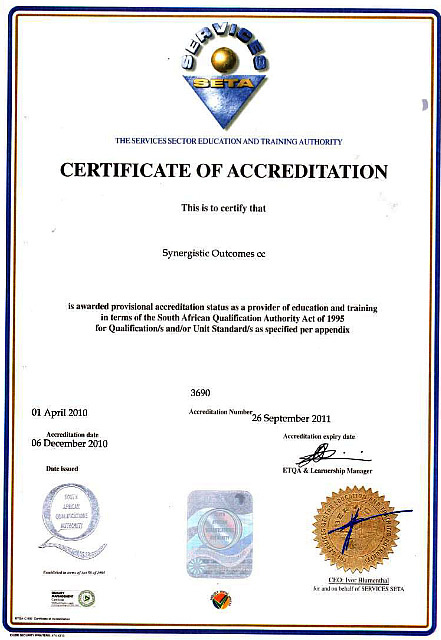 Synergistic Outcomes is training and development provider accredited (no. 3690) with The Service SETA (Sectoral Education and Training Authority) for stipulated learning programmes. We continue to add more learning programmes and improve the quality and value of our service. Synergistic Outcomes is rated a BEE Level 3 Contributor, with a score recognition of 75 – 84% recognition, procurement recognition of 110%. Even though being nervous, the 3rd time going to the front I was not nervous. Watching myself on the video. Standing in front and actually performing the presentation, built my confidence. Presenting whilst being coached plus watching the same for others. Body gestures, body language, vocal presentation. Videos, famous speakers, presentations by delegates. The facilitator presented clear and well, extremely supportive and motivated me; very knowledgeable of the subject; read the group dynamics well. Absolutely spectacular and very widely knowledgeable, yet speaks from the heart indicating a passion for his task. Well done! Knowledgeable fun way of facilitation, use of equipment, excellent. He is alive, dynamic. His many approaches and viewpoints are relevant. Good facilitator, to me he is more of psychologist. A philosopher, great thinker. He has passion and love of what he is doing. Good and well experienced, give real life examples. Very well spoken – knowledgeable about topics at hand.